Off road four wheeling is a hobby enjoyed by people all around the country. Each state has different rules as well as different terrain to ride. In North Carolina, there are many popular locations to enjoy off road four wheeling both on the coast and in the mountains. Here are five popular off road trails in North Carolina. Age restrictions are applied to those wishing to operate an off road vehicle, or ATV. All persons must be at least 8 years old to operate an ATV with an engine less than 70cc. Any vehicle over 70cc but under 90cc can be operated by anyone of at least 12 years of age. ATVs over 90cc must be operated by adults or children at least 16 years old. These rules apply to those born in 1997 or later and for vehicles purchased on or after 2005. Safety certificates are also required for all people born in 1990 or later and safety goggles and helmets must be worn in all areas except for beach areas that allow off road vehicles. This area is located in the mountains of North Carolina close to where it borders Tennessee. 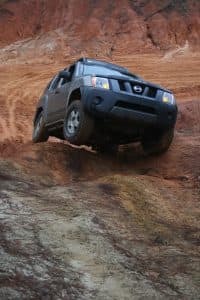 Tellico has quite a few off road vehicle trails that vary in difficulty. Any trail will be a great place to check out your four wheel drive truck or jeep. This area is located close to Wilmington, North Carolina, which is a coastal area of the state. This area has beaches that are off the beaten pat hand allow driving of four wheel drive vehicles on the beach. This area is located in Silver Valley, NC and is home to the Mud Devils, a prestigious four wheeling club. These trails are open many weekends during the season. This area is also located on the coast of North Carolina and has about 70 miles of barrier island beaches that allow four wheel vehicles You can take in the sun and the ocean breeze while testing your off road skills. This off road area is located in Morganton, N.C., an area near the coast. There are 6 miles of trails open to four wheel drive vehicles.